If you love gorgeous invitations and sweet puppies as much as we do, you’re in for a treat today! 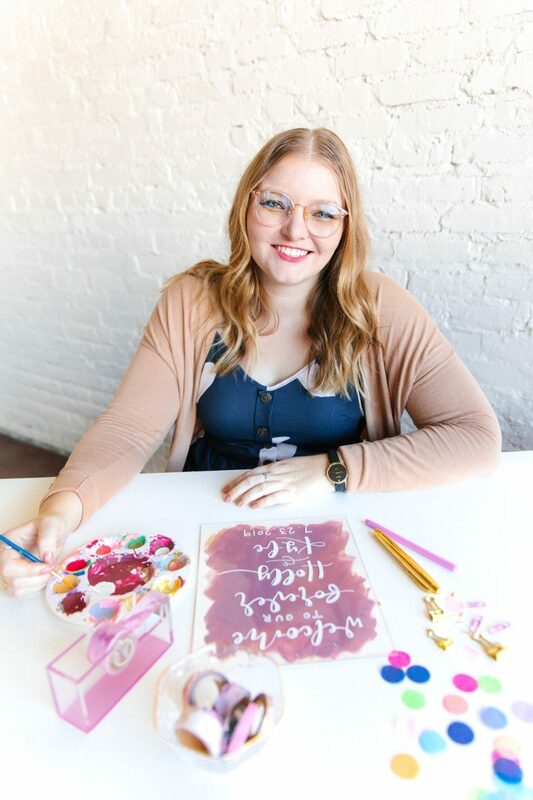 We’re introducing you to Katie Lathrop of Bailey Rose Design, an Austin invitation designer with a knack for unique custom wedding signage and a slight puppy obsession: she even named her business after her precious Corgi pup! “My company name is inspired by my Corgi puppy, Bailey, and she is named after the Irish Cream. My middle name is Rose, so combining the two, I created Bailey Rose Design. I’ve had a lifelong passion for hand lettering. Once I could pick up a pencil, I was interested in the look of different fonts and learning how to mimic them and put my own spin on them. I started with making custom signage of all sorts about three years ago, but found my favorite signs were for weddings. 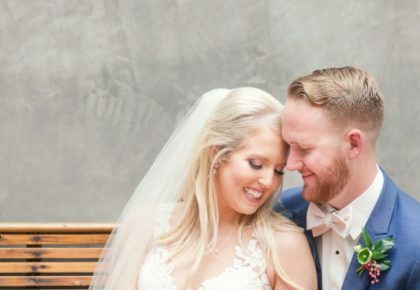 I moved to Austin from California last August and was able to really immerse myself in this wonderful wedding culture here in Austin,” Katie says. 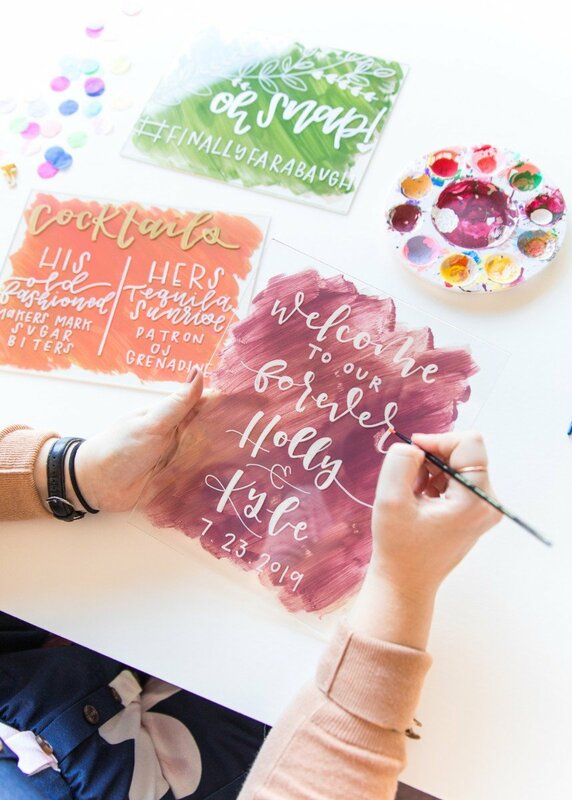 Katie specializes in custom wedding signage and her lettering style is just to-die-for. Elizabeth Denny Photography captured some of Katie’s designs at Trinity Hall downtown. Scroll through the photos below to see a sampling, and stay tuned for more Austin invitation designer interviews soon! 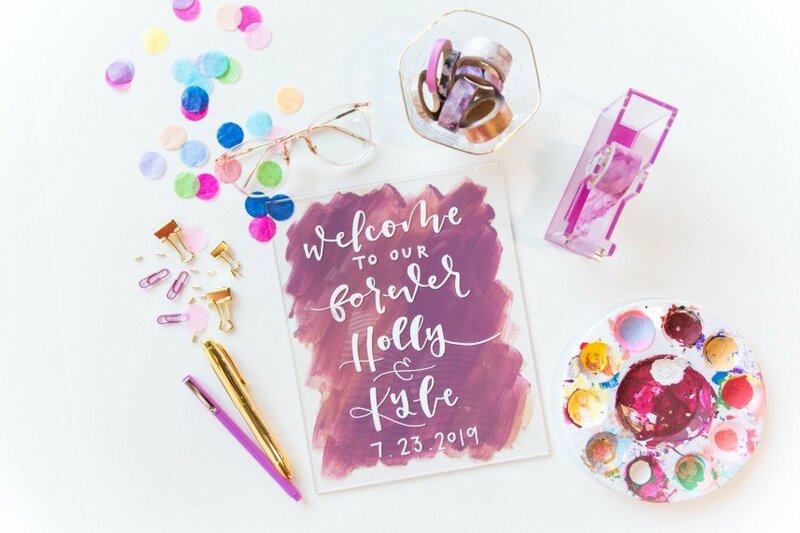 Describe the design you created for this shoot: These designs are pieces of acrylic with a custom blend of colors as a background, hand lettered by me! 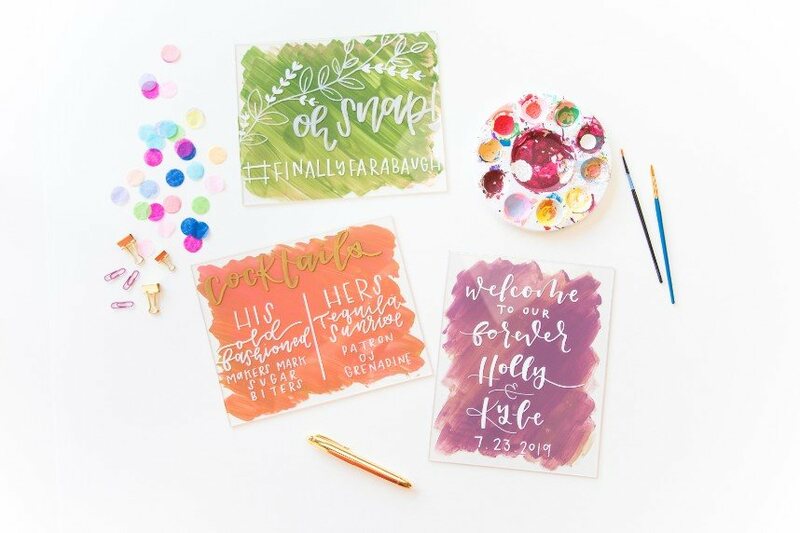 Acrylic is a really great medium and allows for a more customized look to align with the color palette and design of the wedding. These pieces are a welcome sign for the sign in table, signature cocktail decor with his and hers favorite drinks, and a sign showcasing the wedding hashtag. I love the hints of gold and silver in the background colors. In the right light there is a little shimmer that is just so pretty! 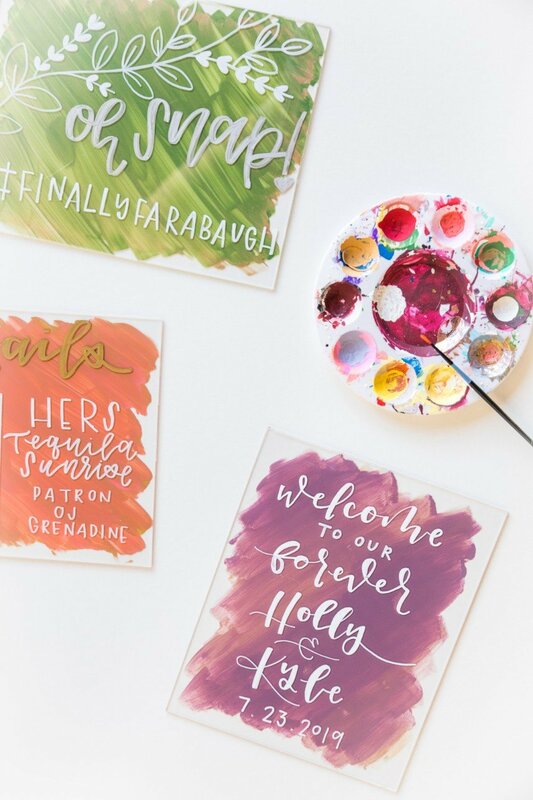 I also love that these are designs that will look good in your home after the wedding. I have a signature cocktail sign on our bar cart at home! 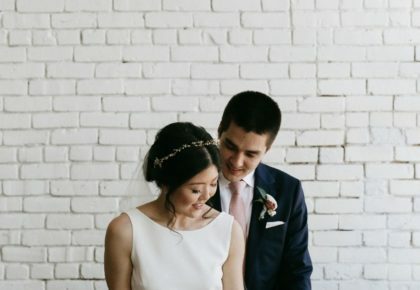 What elements in your personal design/style set you apart in the wedding industry? I like to explore and experiment with different color palettes and mediums for signage. I also take the time to ensure the design is just what the couple wants, and also reflects who the couple is and what they want their wedding to be. When I’m working with a couple it is important to me to hear their story and understand their vision for their wedding. This allows me to ensure the pieces I create are unique to them and their big day. What are some trends you’re loving right now? 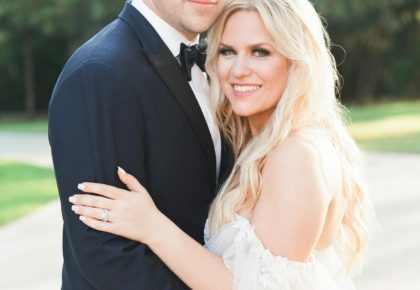 I am loving how couples are putting personal touches to their wedding and showcasing who they are as a couple. Some of my favorite examples are using flowers that connect to a memory (first date, prom, etc. ), having table numbers as their favorite restaurants, adding little touches of the college they went to together, etc. Some other trends I love are “present ceremonies” where couples encourage the guests to not have their phones out and to really be present with them, different items for bouquets (fruit, cotton candy, etc. ), and bars with signature cocktails or a theme! Katie loves taking on signage projects of all kinds, working closely with each couple to bring them pieces that make them happy. 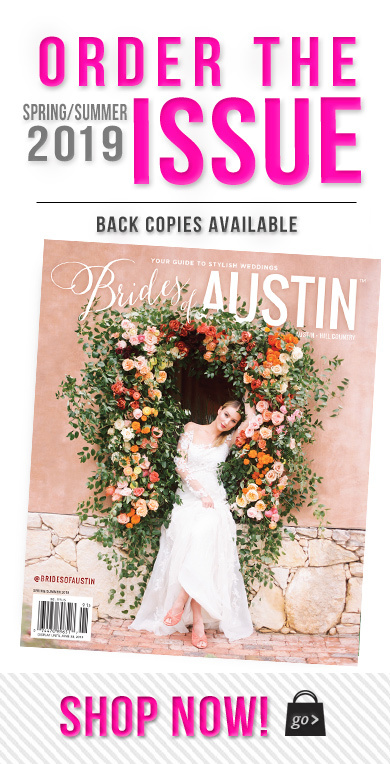 To get in touch with Bailey Rose Design, check out Katie’s Brides of Austin vendor profile. Cheers!